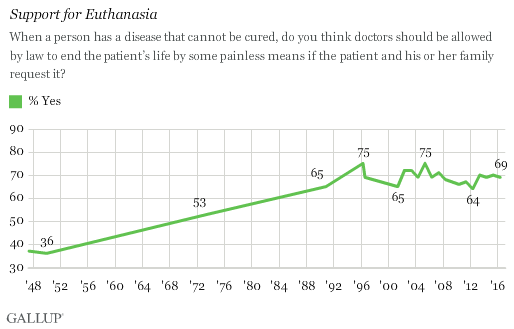 WASHINGTON, D.C. -- A large majority of Americans continue to say euthanasia should be legal, a reversal from the 1940s and 1950s when most thought the practice should be illegal. Sixty-nine percent say that a doctor should be allowed to end a patient's life by painless means if the patient requests it, up from 36% in 1950. Americans' continued support for making euthanasia legal comes as California recently passed its own right-to-die law. The new law in the nation's most populous state, passed last fall, will allow terminally ill patients who meet certain criteria to ask their doctor for life-ending medication. The legislation came as a result of the case of Brittany Maynard, who was diagnosed with terminal brain cancer in California, where physicians previously were barred from prescribing medication to allow terminally ill people to end their lives. Maynard ended her life in Oregon, where the practice was legal. In 1973, Gallup for the first time found a majority in favor of doctors being legally permitted to end a patient's life if requested. That percentage grew to 65% in 1990. In the last 25 years, Americans have solidly been in favor of doctors having the ability to end patients' lives, with between 64% and 75% favoring the practice. While 69% in the U.S. say physicians should be allowed to end patients' lives by painless means, fewer Americans (51%) say they would consider ending their own lives if they personally had a disease that could not be cured and they were living in severe pain. This is down from the last time Gallup asked this question in 2005 (59%), around the time of the Terri Schiavo controversy. Schiavo's husband advocated that Schiavo would not have wanted prolonged artificial life support without the ability to recover, and he chose to have hospice staff remove her feeding tube. The first time Gallup asked this question in 2001, 54% said they would consider ending their own lives if they had a terminal disease. 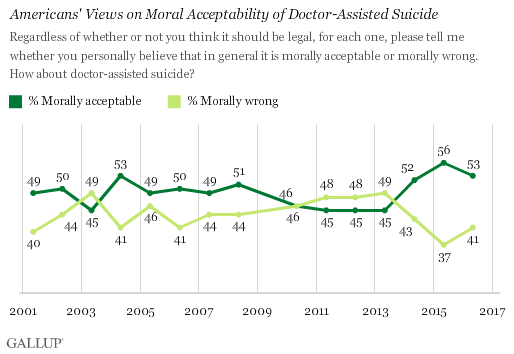 In the same Values and Beliefs poll in May, Gallup asked Americans if they believe doctor-assisted suicide is morally acceptable or morally wrong. A slight majority (53%) say the practice is morally acceptable. Over the past 15 years, the highest percentage of Americans saying doctor-assisted suicide is morally acceptable occurred in 2015, at 56%. This trend has fluctuated between 45% and 56% since 2001. This question uses the word "suicide," which may affect Americans' responses. It is possible that some may not understand the distinction between patients dying with a self-administered medication and a doctor taking action to end a patient's life. California recently joined Oregon, Washington, Vermont, Montana and New Mexico as the only states to allow physician-assisted suicide. California, often a bellwether for change throughout the U.S., may persuade other states to consider passing legislation permitting physicians to allow terminally ill people to end their lives. While Americans appear to be solidly comfortable with the practice, the nation is more divided on the moral acceptability of doctor-assisted suicide. 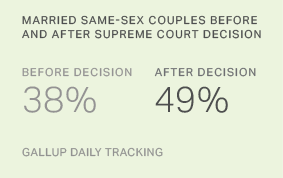 Results for this Gallup poll are based on telephone interviews conducted May 4-8, 2016, with a random sample of 1,025 adults, aged 18 and older, living in all 50 U.S. states and the District of Columbia. For results based on the total sample of national adults, the margin of sampling error is ±4 percentage points at the 95% confidence level. For results based on the half-sample of 521 national adults, the margin of sampling error is ±5 percentage points. All reported margins of sampling error include computed design effects for weighting.